Gerhard-Schoch House - Volz & Associates Inc. 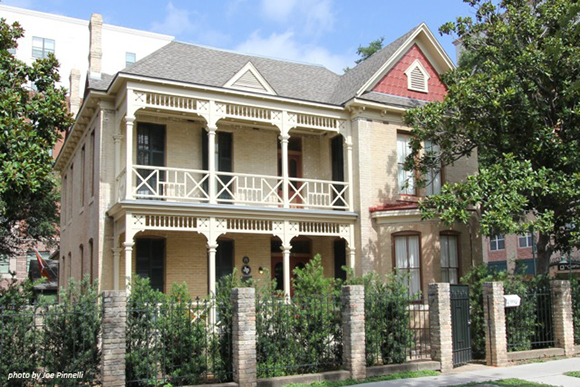 The Gerhard-Schoch House, located in the heart of West Campus at 2212 Nueces, was constructed in 1887 by contractor Herman S. Love for Philip and Lena Gerhard. The Italianate house is thought to be the first brick-veneered structure in Austin. The home was expanded almost immediately, in 1891. The house was owned and continuously occupied by the Gerhard and Schoch families until 2011, when the current family purchased the house. They undertook a comprehensive project to preserve the historic home, now in the thick of intense urban redevelopment. This work both restores significant components of the historic exterior that have not been visible for more than a century, and makes improvements to energy efficiency and material conservation that will further extend the life and viability of this important historic property.